The fam and I recently returned from a brief vacation, during which I grabbed a nice fat stack of vinyl, for both Iron Leg (some very interesting stuff) and the Corners. Look forward to coming blog posts as well as September’s Iron Leg Radio Show for all manner of groovy sounds. The tunes I bring you today represent one of my favorite discoveries (for me personally) of the last five years. I forget where I first encountered the sounds of Mark Eric, but I suspect it was on the interwebs somewhere. 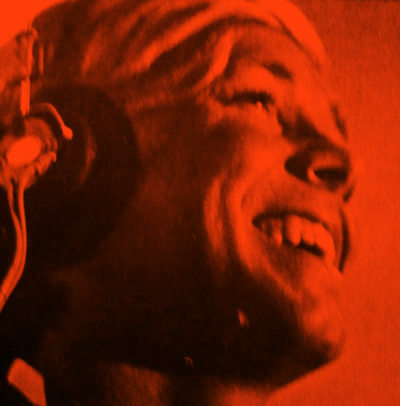 His sole LP, 1969’s ‘A Midsummer’s Daydream’ is a fairly scarce item, mainly because it went nowhere when it was first issued, and because those that have encountered it since have hard filed it. Mark Eric’s music has been described – accurately – as some of the best Beach Boys material not actually created by Mr Wilson and his henchmen. Eric, born Mark Eric Malmborg not only looked the part, with his sun-bleach blond good looks (he spent some time as a TV actor) but seems to have internalized the post-Pet Sounds vibe, mixing it with a healthy dose of Sunshine Pop. He recorded ‘A Midsummer’s Daydream’ in 1969 with Animals guitarist Vic Briggs twiddling the knobs and arranging. I’m always amazed that someone was able/willing to pull something like this off in 1969. There were certainly legions of Brian Wilson fanboys appropriating his sound (ironically or not) in the 80s and 90s, but for someone to dig this deep into that sound, and pull it off so well while the Beach Boys prime was still in the ether (as it were) was remarkable. The three tracks I bring you today should provide a pretty nice introduction to Mark Eric. ‘California Home’, the track that opens the LP shows the level of sophistication at work. While he might not have had the laser-like focus of someone like Curt Boettcher (or Wilson himself), Mark Eric was no slouch in the ‘creating a soundscape’ department. ‘California Home’ features his own Brian-esque vocals and harmonies, laid atop a well-crafted arrangement. By 1969, with the Brian Wilson pulled out from under them (mostly) the Beach Boys had kind of gone off the rails, and while they were still doing some very interesting work (‘Friends’ and ‘Surf’s Up’ especially) with the other members flexing their creative muscles a bit more, they were incapable of the kind of consistency that Mark Eric brought to his album. This is of course a wholly theoretical exercise, since the Beach Boys/Brian Wilson probably had no idea who Mark Eric was, and certainly weren’t involved with the project in any way. However, the record store basements of the world are packed floor to ceiling with 45s by acts that were dead set on imitating the Beach Boys, Beatles, Byrds, Rolling Stones and others, most of whom made a hash of it. To hear an entire album so well done, in regard to songcraft, arranging and performing, yet so obviously derivative is a remarkable and rare thing. ‘Night Of the Lions’ is as close to a ‘rock’ track on the LP, and its French horn, harp and strings bring some of Jan and Dean’s best “Wall of Surf” productions. The song has had an interesting life of its own, appearing on the soundtrack to the biker film ‘Angels Die Hard’. It was also redone on the album ‘Surf Symphony” by Jan Rubini, with new a new guitar line added to the original track. ‘Where Do the Girls of the Summer Go’ is the finest “sunshine” track on the album. The melody takes some intriguing turns into Bacharach territory. Though some have classified Mark Eric as “soft pop” – and there are undeniable elements of that sound here – I would say that his songs/records are generally more sophisticated and satisfying than a lot of that genre, offering incentive for multiple listens. 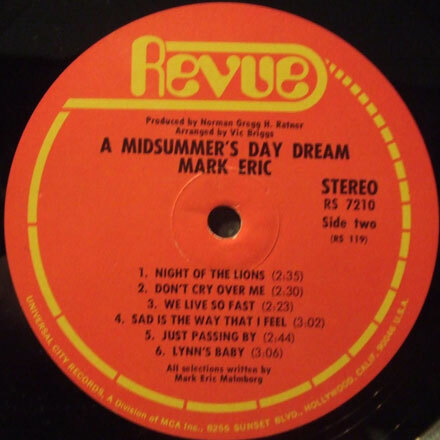 The big mystery for me, and certainly one of the reasons that ‘A Midsummer’s Daydream’ is so intriguing, is that after creating something so wonderful, Mark Eric seems to have just walked away from music. His acting career lasted a few years and consisted of episodic TV roles (the Partridge Family, The Bill Cosby Show, Hawaii Five-O), one film (Pretty Maids All In a Row) and a number of commercials. He released one, rare 45 as Mark Erickson and the Point Dume Boys on the Cove label in 1970, but apparently nothing after that. Apparently he did at least one live performance around the time ‘A Midsummer’s Daydream’ was reissued by Rev-Ola in the early 2000s. The album was available on iTunes for a while, but it doesn’t look like it’s there any longer. Original copies of the album don’t turn up too often, and when they do they run between 40 and 100 dollars, but you can still find affordable copies of the CD reissue. I hope you dig the tracks, and I’ll see you all next week. I have the Rev-ola cd and it’s my favorite Beach Boys Album That Never Was. You can catch a few glimpses of Malmborg in “Pretty Maids All In A Row” though he’s hard to notice amongst all the boobity. Great album. I’ve had the CD for years. Heard of it in the reissues section of Mojo whenever that was and it intrigued me. Well worth it. Best Beach Boys album of the late 60s. Too bad they didn’t draft him as a replacement for Brian Wilson.